One of the keywords of our time, ‘globalization’ frames how we understand our interconnected world. An ambiguous signifier carrying multiple meanings, the term is usually used to refer to the extension and intensification of social relations across the world. Many works have been authored that deal with various aspects of globalization. However, it is surprising that no critical history of the concept has yet provided a historical mapping of its conceptual origins, evolution, and genealogical lineages. 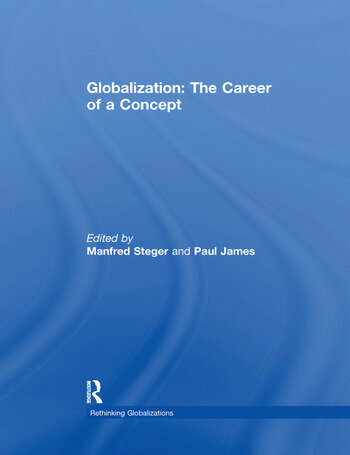 This book investigates the meaning formation of ‘globalization’ by featuring interviews with twelve prominent academic pioneers of the new trans-disciplinary field of Global Studies, who were central in forging the ‘career ‘of the concept of ‘globalization’. Together with an introductory chapter, these interviews clarify how and why a previously obscure scholarly concept suddenly exploded in the public discourse of the 1990s. In particular, the interviews trace the processes by which economistic discourses of free market economics became the basis for the influential association of the meaning of ‘globalization’ with the dominant neoliberal framework of the 21st century. This book was originally published as a special issue of Globalizations. Manfred B. Steger is Professor of Political Science at the University of Hawai’i-Manoa, Honolulu, USA, and Professor of Global Studies at RMIT University in Melbourne, Australia. He has served as an academic consultant on globalization for the US State Department and is the author or editor of over twenty books on globalization and the history of political ideas. Paul James is Professor of Globalization and Cultural Diversity at the University of Western Sydney, Penrith, Australia, and Research Director of Global Reconciliation, an international organization based in Australia. A Fellow of the Royal Society of the Arts (London), James has delivered invited addresses in over thirty countries and is author or editor of 26 books.